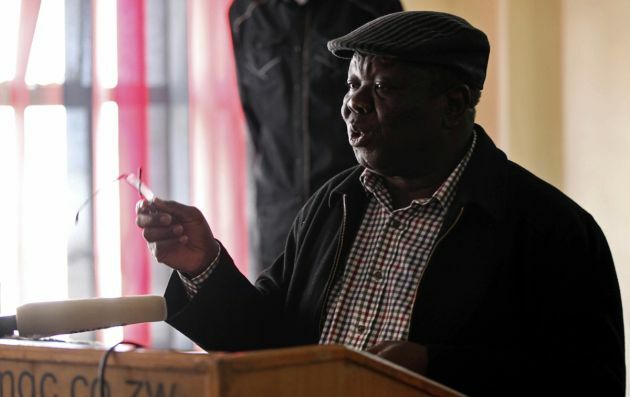 (Photo: REUTERS / Philimon Bulawayo)Zimbabwe's Prime Minister Morgan Tsvangirai gestures during a media briefing in Harare August 1, 2013. Tsvangirai dismissed Wednesday's election as a "huge farce" and said the results were invalid because of intimidation and ballot-rigulging by President Robert Mugabe's ruling party, which is claiming victory. A broad range of church leaders in Zimbabwe have called for peace and restraint as tensions rise over the results of Wednesday's general elections which the Movement for Democratic Change leader Morgan Tsvangirai has said are "null and void," citing massive voting fraudulence. The church leaders said they are willing to mediate to help solve the impasse triggered after the elections. The elections were marred by accusations from Tsvangirai and indepdenent monitorring group who called them a farce due to a fraudulent voters' roll. Tsvangirai said prior to the vote that the Zanu-PF party of the 89-year-old President Robert Mugabe had stolen the election of 2002 and 2008. Mugabe's Zanu-PF has ruled the country since it gained independence from Britain in 1980 and had on Saturday won 137 of the 183 seats announced by the Zimbabwe Electoral Commission (ZEC). There are a total of 210 seats and Zanu-PF is close to a two-thirds majority. Roy Bennett, treasurer of the MDC said people should force Mugabe's Zanu-PF to "rule by themselves." The MDC has already said it will not recognise the results, alleging fraud. Zimbabwe Electoral Commissioner Mkhululi Nyathi resigned from the ZEC, citing the unprofessional manner in which the elections were run. "While throughout the whole process I retained some measure of hope that the integrity of the whole process could be salvaged along the way, this was not to be," Nyathi said in a resignation letter, Reuters news agency reported Saturday. Monitors from the African Union and the Southern African Development Community, a regional economic bloc, however declared that the problems were not serious enough to invalidate the election. "I have never seen an election that is perfect," said former Nigerian president Olusegun Obasanjo, the leader of the African Union delegation, after noting problems that dogged the vote. "We do not believe these instances will add up to the result not reflecting the will of the people." The MDC's Bennett said, "I'm calling on the people of Zimbabwe, who are our constituents and who we represent in the positions we hold, for passive resistance and for total disengagement. "And let Zanu-PF rule and rule by themselves and bring the country to a standstill." Tsvangirai, 61, earlier said the vote was "null and void". Church leaders pointed to a number of anomalies in the electoral process, but said the actual voting process and administration was conducted peacefully. They also raised concern over the inaccessibility and verification of the voters' roll and challenges experienced during the special voting process. The Zimbabwe Heads of Christian Denominations, comprising leaders of the Zimbabwe Catholic Bishops Conference, The Zimbabwe Council of Churches and the Evangelical Fellowship of Zimbabwe appealed for calm and called on all parties to accept the results. "We urge all political parties and stakeholders who feel aggrieved by any challenge or issue to act in a restrained manner that will allow for dialogue, due process and the preservation of peace and stability in Zimbabwe," the church leaders said. The church leaders' call Saturday came as Zimbabwe security forces mounted roadblocks along main roads leading into major towns, where they are stopping vehicles and searching for weapons. "We call on political parties and their leaders to act in a manner consistent with the peace we have experienced so far and, notwithstanding any election challenges, to do everything in their power to honour their pre-election pledges to abide by election outcomes. "Where there are legitimate and substantiated irregularities and anomalies, we urge concerned parties to resolve these through peaceful dialogue, law abiding and in an orderly manner. We urge the nation to remain united in prayer, faith and hope and to maintain a spirit of restraint, tolerance and harmony." The church leaders said they are willing to mediate to help solve the impasse of the election results. Bishop Alexio Churu Muchabaiwa of Mutare, chairman of the national Catholic justice and peace commission, said in an Aug. 2 telephone interview with Catholic News Service from Mutare that the polls "were very peaceful compared to the 2008 elections," which were marred by violence and intimidation. "But there was intimidation this time around, too," he said, particularly in rural areas, traditionally strongholds of Mugabe's party. Zanu-PF spokesman Rugaro Gumbo predicted that Mugabe, who is running for a seventh term, would get at least 70 percent of the vote in the presidential poll. "We are expecting a landslide victory," he was quoted as saying in Zimbabwe's state-run Herald newspaper.